Think of it this way: There's only about one week left of unsubstantiated rumor and general idiocy before Apple finally ends it. The iOSphere became still more convinced that mobile payments via iPhone are just days away with the expected Sept. 9 unveiling of iPhone 6. In part, the new optimism is based on photos purporting to show the iPhone 6 logic board with a chip from NXP Semiconductor, which offers a variety of short-range near-field communications (NFC) components. And there was a dramatically vague "report" that Apple and American Express have signed some kind of deal to do something with regard to mobile payments somehow. Also this week, rumors of an inexplicably redesigned iPhone charger which is assumed to be related to the expected bigger battery for the expected bigger phone, or phones. Finally, an investigation about whether a silkscreened part number on a low res photo is an 8' or a B' results in the dispiriting conclusion that it's an 8 and therefore the iPhone 6 will have "only" 1GB of RAM. Re/code reports that Apple and American Express have struck some kind of agreement about some kind of plan for mobile payments, according to the post by Jason Del Rey. Del Rey cites "sources familiar with the talks." If they are familiar with the talks, they shared precious few of the details to make sense of them. Del Rey simply doesn't explain, presumably because he doesn't know, what the agreement actually is, or how Apple' s mobile payments system will or might work. "Apple's new payments system is expected to let iPhone 6 owners use their phones in place of credit cards, debit cards or cash to pay for goods in brick-and-mortar stores," according to Del Rey. "Customers will present their phones at the checkout counter of partnering retailers to transmit payment information to complete a purchase." It was recently reported by The Information, a news site, that Apple and Visa had reached an equally vague agreement. None of these rumor reports outline what these partnerships actually entail, or how "presenting the phone" would actually result in a completed, verified transaction. It is widely expected that Apple will make use of the verified credit cards in its massive database of iPhone users with Apple IDs; and eventually Apple's Touch ID authentication. But however the mobile payments system is set up, it will have to be at least as secure as, and probably more convenient than, swiping a physical credit or debit card in a card reader or using cash. Apple and a group of retailers and card processors presumably could make use of existing networks and backend payments systems. But the front-end user experience, which is Apple's obsession, will have to extremely simple and extremely reliable. If this sounds familiar, it is. It's a recurring theme for over a year. The newest assertions come from a post at Wired, where Christina Bonnington writes that "our sources say" Apple will introduce on the iPhone 6 mobile payments that use a built-in NFC chip. Bonnington says that "Apple has remained curiously silent on the mobile payments front. Well not anymore." Perhaps it's only curious if you consider something like Google Wallet to be a resounding success. Jason Del Rey, Re/code.com, presenting the totality of his explanation - based on "sources familiar with the talks" between Apple and American Express - on how Apple's mobile payments will work on the iPhone 6: You use your phone. The iPhone 6 will introduce Apple's mobile payments platform and the anonymous sources claim it will be a hallmark feature of the new phone. "We're told the solution will involve NFC," she says. Larger-sized iPhones would let Apple more easily incorporate the NFC chip and its substantial antenna. Bonnington, and other writers, have pointed to several Apple patent applications or awards over the past few years that deal with NFC. But there's little information in public that suggests Apple is ready to make a major investment in NFC, especially when its Bluetooth 4.0-based iBeacon specification would provide an alternate, and in some ways, superior network connection. Bonnington does reference iBeacon, but as with most of the "reports" about an Apple mobile payments system it is only the most general outline. "The company has made a huge push to get its Bluetooth LE-transmitting iBeacons into retailers across the country," she says. "And because Apple did not spend a great deal of time expounding on iBeacons at WWDC this year, it's possible they could be a greater focus at Apple's September media event -- as a part of its mobile payment solution." In other words, because Apple didn't say anything about this technology, we know it must be important. To The Rollup, NFC as Apple's payments infrastructure still seems like a longshot. But one possibility is for Apple instead to use NFC mainly as a sensor and device interface. Several photos have recently surfaced online purporting to show a NFC chip from NXP Semiconductor, based in The Netherlands. Some bloggers, assuming the photos to be legitimate have assumed the chip is for mobile payments. But NXP just announced a new passive NFC package that combines a contactless NFC interface with a contact I2C interface and onboard non-volatile memory. The idea is to let mobile devices interact with a range of devices and sensors, including via the "embedded microcontroller of any electronic device." NCP has a YouTube video that shows one application, using a smartphone to control a washing machine. An unsourced photograph purportedly reveals a redesigned charger for the iPhone 6 in the U.S. market, according to a staff post at AppleInsider. "The part depicted in the photograph, which appeared on Chinese microblogging site Sina Weibo, bears the same physical design as Apple's current charging adapter in Australia. It is slightly wider than the current U.S. model, with notches on either side to allow a more solid grip when plugging and unplugging," according to the post. Why would Apple redesign the charger? "There is no word on why Apple would make such a move, though it is possible that the company plans to increase the charger's capacity above its current five watts," AppleInsider speculates. "The so-called "iPhone 6" is rumored to ship with a battery some 46 percent larger than the battery in the iPhone 5s." The post repeated a recent rumor that Apple is redesigning the Lightning charger cable so that one end has a reversible USB Type-A plug, meaning you can push the plug into the port with either side up. How likely that is depends on how much credence you give to other unsourced photographs. The dispiriting rumor that Apple will keep iPhone 6 RAM to the same 1GB in the current iPhone 5s and 5c was renewed this week when a new photo from Field & Volk and Australian Leaker Sonny Dickson showed what purports to be an assembled logic board for the new phone. Various deductions, including some crowd-source speculation in the MacRumor forums, reached the conclusion that the A8 chip shown has 1GB of RAM, according to Eric Slivka's post at MacRumors. 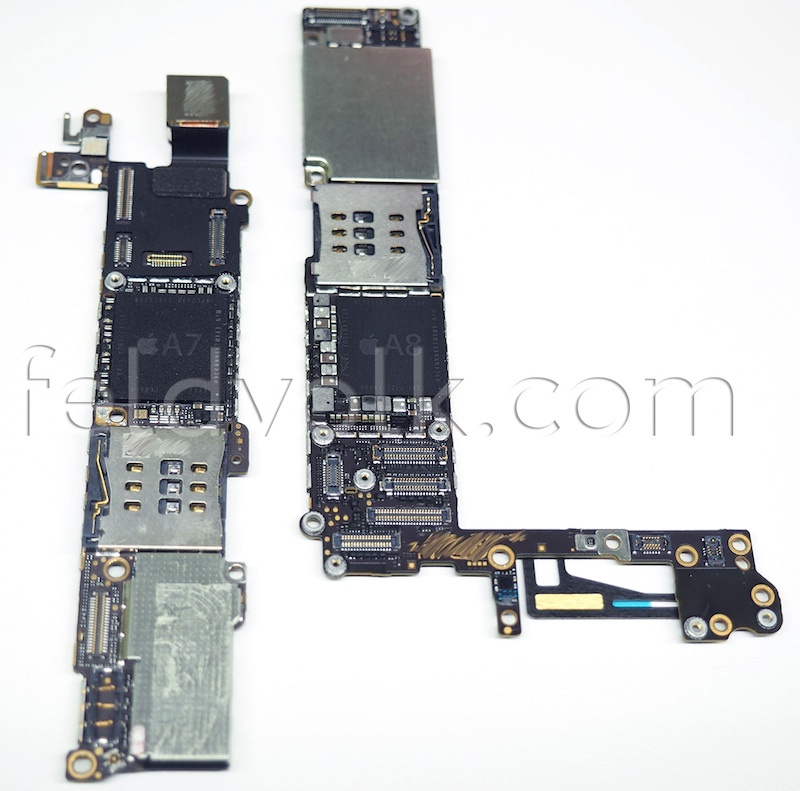 Here's the purported iphone 6 logic board, for a 4.7-inch model at right, compared to the existing iPhone 5s logic board at left. One forum member claims that the A8 processor shows it contains RAM from Korea's Hynix. "Based on Hynix's part number format, the character in the eighth position reveals the amount of RAM in the package, with an "8" denoting 8 Gb (1 GB) and a "B" denoting 16 Gb (2 GB)," according to Slivka. "While it is a bit difficult to read the part number clearly given the distance and angle in the photo, our staff and several posters in our forum agree that the character very much appears to be an 8, indicating 1 GB of RAM," he concludes. Talk about conclusive. "Are you blind? That's clearly a B." "I'm telling you, it's an 8!" "Let's put it to a vote. All those who think it's an 8, raise your hands....."